Art by Charles Nicholas & Vince Alascia. 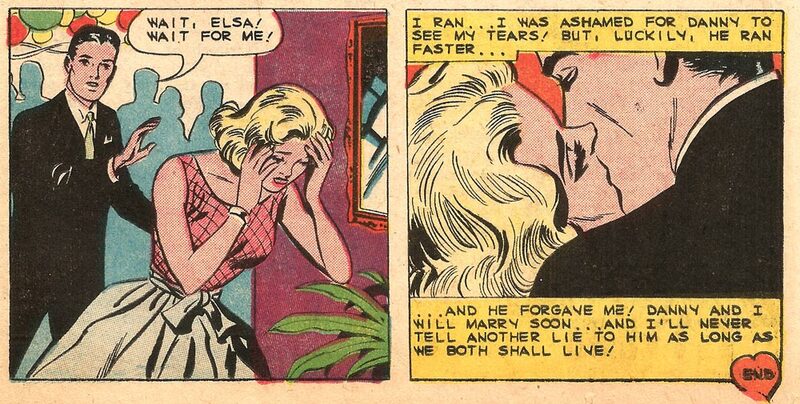 From First Kiss #11, 1959. Click on art to enlarge. After we’re married, I’ll stop lying to you…and your parents…and some of your friends. For example, here’s the truth about my age. I’m 25. And, from now on, I’ll be 21 every year. Forever. That’s the truth. And anyone who says otherwise is LYING! See the spiffed-up, new version of this art with new, funny dialogue in today’s Last Kiss Comic.